Liam Bushell, 26, of Gravesend, was sentenced to five years and three months at Maidstone Crown Court on 7 August 2018 after a jury found him guilty of robbery and an attempted robbery.The jurors heard how between 12.35am and 1am on 30 March 2018 Bushell booked a taxi from Orchard Road, Northfleet to York Road, Kings Farm, Gravesend. No money for fare When Bushell arrived at the address he claimed he did not have the money to pay the fare. The victim offered to take him to a nearby cash point however Bushell said he did not have his wallet on him. He also claimed to not have a phone so could not pay the next day.The taxi driver asked Bushell for his phone number and at this point Bushell used a glass beer bottle to hit the driver over the back of his head.Realising he was bleeding the victim put his hand on his head and was struck again. The driver immediately got out of the car and ran up the road for help.The victim turned back to see that Bushell was running away from the taxi with a carrier bag. The driver returned to the car to find that his mobile phone, takings from the previous night, a tablet computer, a Dash Cam and a further security camera had all been stolen.The victim went to hospital to be treated for lacerations to the back of his head.On 4 April Bushell requested a taxi to collect him from a pub in Old Road West, Gravesend, at around 3.40am. After the taxi driver picked him up Bushell directed him to Oak Road.Having asked Bushell where he would like to stop Bushell then hit him on the back of the head twice with a beer bottle. Shouts for help The victim got out of the car and shouted for help. At the same time Bushell attempted to get into the taxi driver’s seat. 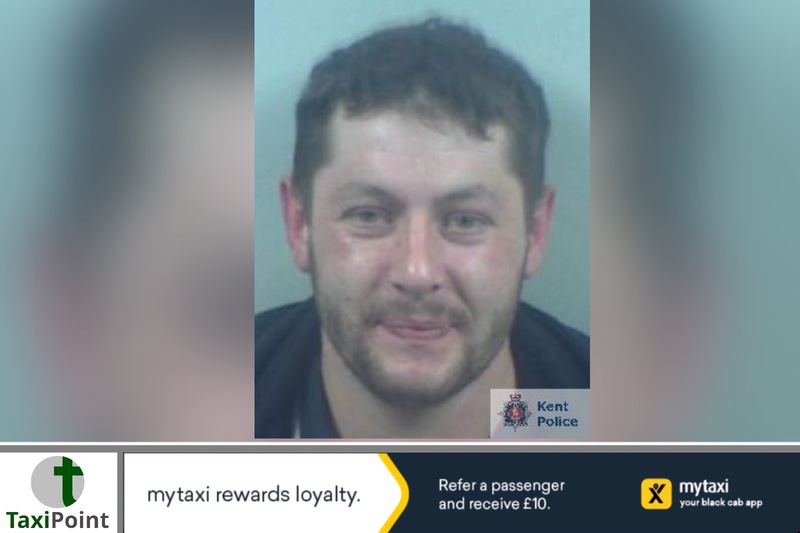 The victim, who had fallen to the floor, got up and attempted to stop Bushell from stealing his taxi.Bushell continued to attack the victim who also fought back, until two people from a nearby house came out to help. Bushell then ran away.Officers arrived and the taxi driver was taken to a nearby hospital where he was treated for various cuts and scratches and a large cut to his head.While carrying out enquiries into the incident officers found a mobile phone nearby which belonged to Bushell. He was also identified through Dash Cam footage filmed during the second incident.He was located at around 2.20pm on 4 April in Kitchener Road, Gravesend, where he was arrested and subsequently charged with the offences.Investigating officer Detective Constable Iain Joyce said: “Bushell carried out vicious attacks on both men who were entirely innocent and working to make a living.“He booked both taxis knowing that he would not be paying the fares and went equipped with a beer bottle on both occasions which he used to cause injuries.